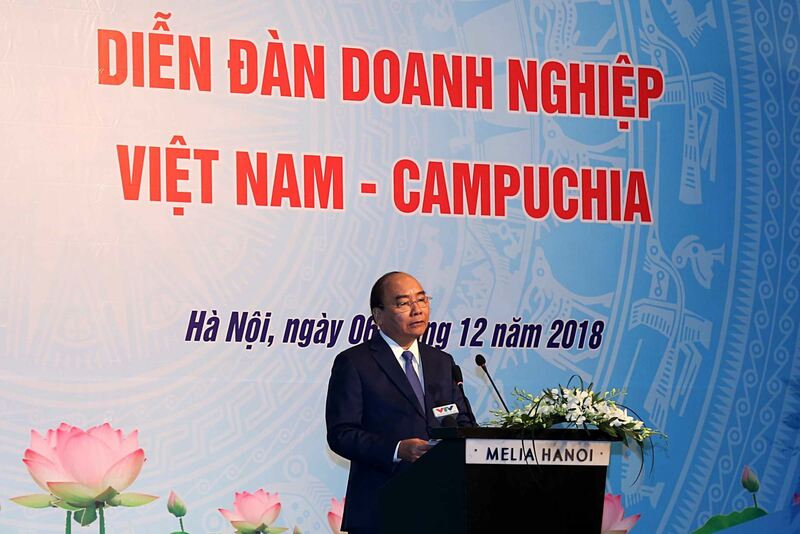 (MPI) - This is the directing speech of Prime Minister Nguyen Xuan Phuc at the Vietnam - Cambodia Business Forum jointly held by the Ministry of Planning and Investment, Ministry of Foreign Affairs, relevant ministries, branches and the Association of Vietnamese Investors in Cambodia (AVIC) on December 6th, 2018, on the occasion of the official friendship visit of Royal Cambodian Prime Minister Hun Sen in Vietnam. The Forum is an opportunity for the Royal Prime Minister Hun Sen to present a message on orientations and prioritized policies for investment cooperation with Vietnamese enterprises and an occasion for Vietnamese enterprises to exchange, discuss with ministries, branches and agencies of Cambodia to find opportunities for investment cooperation, explore environment and approach Cambodia's new investment policy. At the same time, it is also an opportunity for Vietnamese enterprises having investments in Cambodia to present obstacles to the governments of the two countries. Speaking at the opening of the Forum, accessing the investment cooperation situation of Vietnamese enterprises in Cambodia and orientations in the coming time, Deputy Minister of Planning and Investment Vu Dai Thang said that implementing the policy of governments of Vietnam and Cambodia in bringing the economic relationship between the two countries to a new level, commensurate with the relationships and potentials of each country, in the last time, the ministries, branches of two sides have dynamically implemented activities to promote bilateral investment cooperation, trade and tourism relationship, and so far have achieved remarkable results. To further promote investment activities of Vietnamese enterprises in Cambodia and Cambodian enterprises in Vietnam, the Ministry of Planning and Investment (MPI) propose state agencies of the two countries to continue implementing the signed treaties and agreements between the two countries to create a legal basis, ensuring the investment and business activities, and untangling difficulties and obstacles of enterprises; continue pushing negotiations, heading towards the signing of the Vietnam - Cambodia Bilateral Trade Acceleration Agreement, agreements on bilateral cooperation in the fields of industry, mining and energy, agreements on cooperation in forestry and fishery; continue to perform the contents of the minute of the 16th Meeting of the Cambodia-Vietnam Joint Commission on Economic, Cultural, Scientific-Technological Cooperation, deploying the "Common Framework on Vietnam and Cambodia Connectivity until 2030". At the same time, each country needs to continue improving the legal system on investment, trade and boosting the reform of administrative procedures relevant to investment and business, ensuring transparency, synchronism and consistency from the central to localities, creating an environment to attract and promote investment. The two sides also need to continue upgrading and improving infrastructure system, especially transport infrastructure, ports, electricity, and water, etc. and delivering special preferential policies to encourage all economic sectors to participate in investment in these fields, contribute to boosting the production and trade of enterprises. Speaking at the Forum, Prime Minister Nguyen Xuan Phuc said that in the context of a good cooperation in all fields between the two countries, leaders of the governments of the two countries frequently solve difficulties for enterprises of two countries. With the trade turnover in 2018 estimated at 5 billion USD, Prime Minister Nguyen Xuan Phuc believed that by 2020 it may reach 7-8 billion USD. In the coming time, the economic situation in the world and the region will open many intertwined advantages and challenges, requires the two countries to cooperate more closely and effectively. In fact, the potential for the cooperation of the two countries is still vast. If we know how to exploit it well, it can create a strong outburst of cooperation between the two countries, bringing in mutual benefits, Prime Minister Nguyen Xuan Phuc emphasized. Besides, the two countries are members of ASEAN. In the framework of the ASEAN Economic Community, there are many favorable regulations to open the market for capital, goods, labor, and services. This is the basic platform for enterprises to make the most out of these advantages. 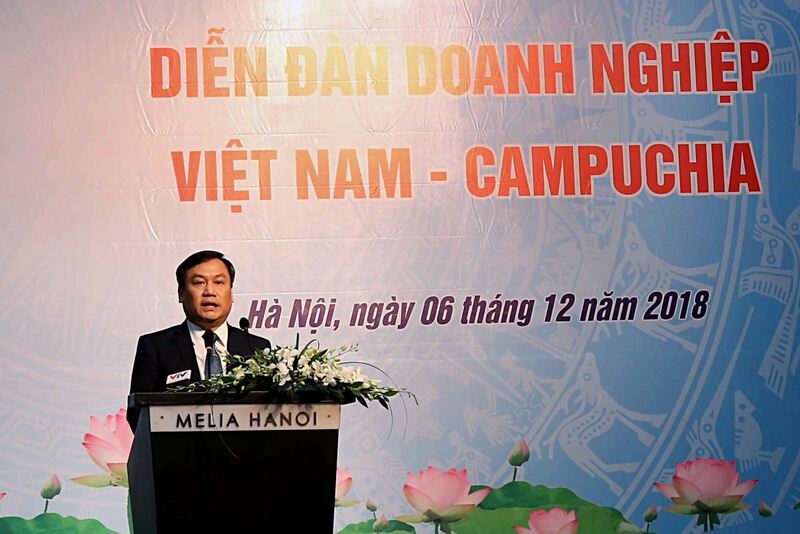 The Government and the Prime Minister of Vietnam always support, assist and facilitate favorable conditions for Vietnamese enterprises to invest in Cambodia. 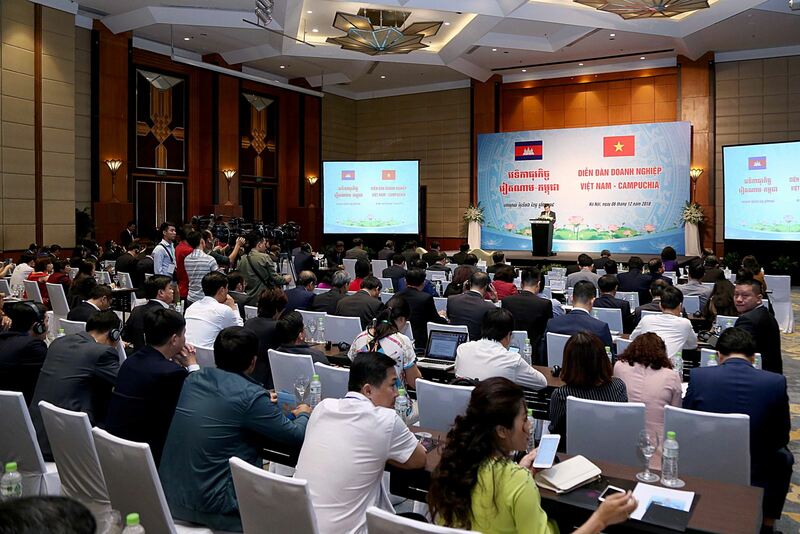 The Prime Minister also reminded Vietnamese enterprises that besides the interests of enterprises, they also need to pay attention to training and transferring technology to Cambodian partners, performing social activities, caring for the community and well protecting the environment. The big corporations and enterprises of Vietnam such as Viettel, PVN, EVN, Rubber Group, BIDV, etc. must be the pioneer Vietnamese investors to invest successfully in Cambodia. Speaking at the Forum, Royal Cambodian PM Hun Sen highly appreciated the trade and investment cooperation activities between the two countries in the last time and he highly appreciated the Government and the Prime Minister of Vietnam for successfully running the economy in a professional way, helping to control inflation well. This has a positive impact on the Cambodian economy. 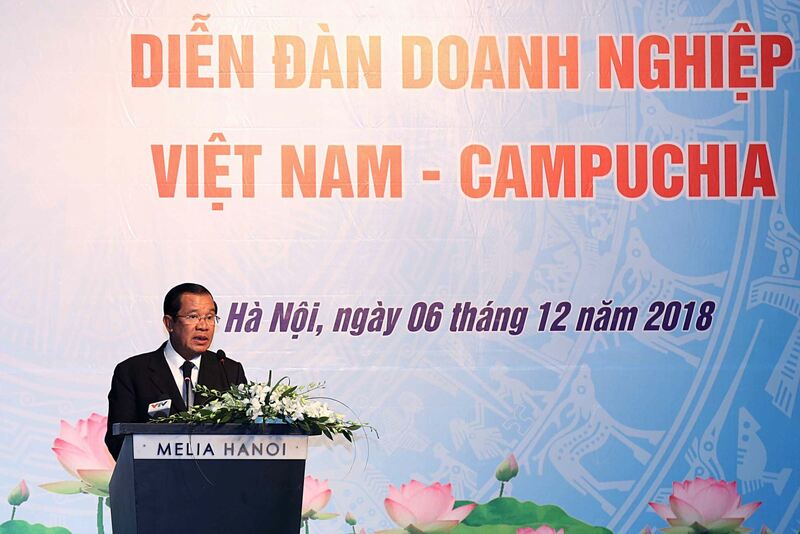 Presenting some potentials and investment opportunities in Cambodia, Royal Cambodian Prime Minister Hun Sen said that Cambodia is implementing an industrial development policy period 2015-2025 to implement a new growth strategy. Along with that, it boosts administrative procedures reform related to taxation, customs, cut down costs for enterprises; promote investment in hard infrastructures such as deep seaports, expressways, highways connecting to ports and neighboring countries. According to the Ministry of Planning and Investment’s statistics by the end of November 2018, regarding investment, Vietnam has 210 projects registered to invest in Cambodia with a total registered capital transferred abroad of 3 billion USD, focusing on fields of agriculture, banking, telecommunication – information technology, industrial production, etc. On Cambodia side, until now, Cambodia has 20 investment projects in Vietnam with the total registered capital of 64.67 million USD, mainly in the fields of agriculture, forestry, fishery, warehouse transportation, etc. Regarding trade, the trade turnover between the two countries was maintained at a high and continuously increasing rate in recent years. In 2017, the two-way trade between Vietnam and Cambodia reached 3.8 billion USD, up nearly 30% over the same period in 2016. In the first 10 months of 2018, the trade turnover reached 3.87 billion USD, up 23.64% as compared to the same period in 2017. With this positive growth momentum, it is likely that the bilateral trade turnover in 2018 will exceed 4 billion USD, creating an important premise for fulfilling the target of reaching 5 billion USD in bilateral trade by 2020. In terms of tourism, cooperation between the two countries has a certain development. The total number of tourists between the two countries tends to increase in the future thanks to the potentials and policies to promote tourism development of the two governments. To achieve the results mentioned above, it is necessary to affirm that, in the last time, the ministries, branches, and localities of the two countries have worked closely and actively in developing the necessary legal framework to encourage cooperation activities in investment, trade, and tourism between the two countries through the signing of bilateral and multilateral agreements and treaties. At the same time, the governments of the two countries also have many activities for exchanging information, strengthening state management, promoting, supporting and seeking to solve difficulties, obstacles and facilitating conditions for enterprises of the two countries to invest and do business fluently in each other country. In addition, the diplomatic representative agencies of the two countries as well as business associations and organizations also regularly organize activities to promote investment and support Vietnamese enterprises to invest in Cambodia./.